To say I left Fogo Island reluctantly is a gross understatement. It’s one of those places where I know I am going to look back and say “Why didn’t I spend more time there?” But I’ve made a commitment back in Maine at the end of August, so I must keep moving. 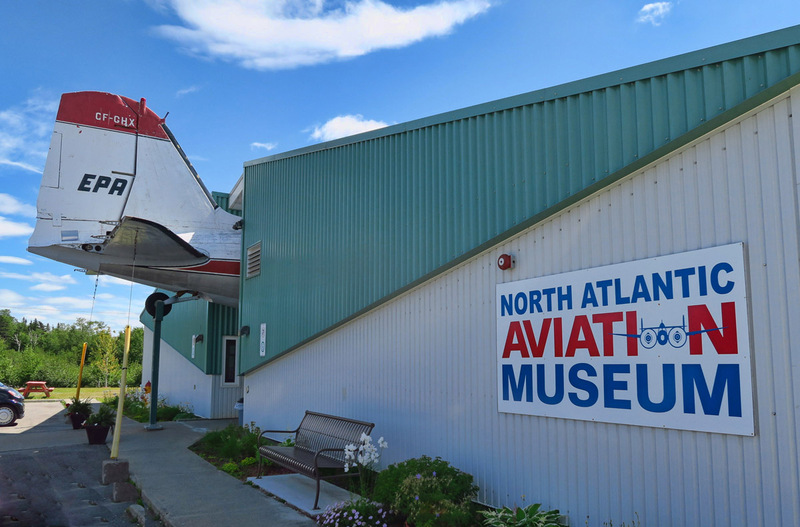 I want to stop at the North Atlantic Aviation Museum in Gander as I head east around the island of Newfoundland. Often referred to as “the lifeboat of the North Atlantic,” Gander is familiar to pilots the world round. 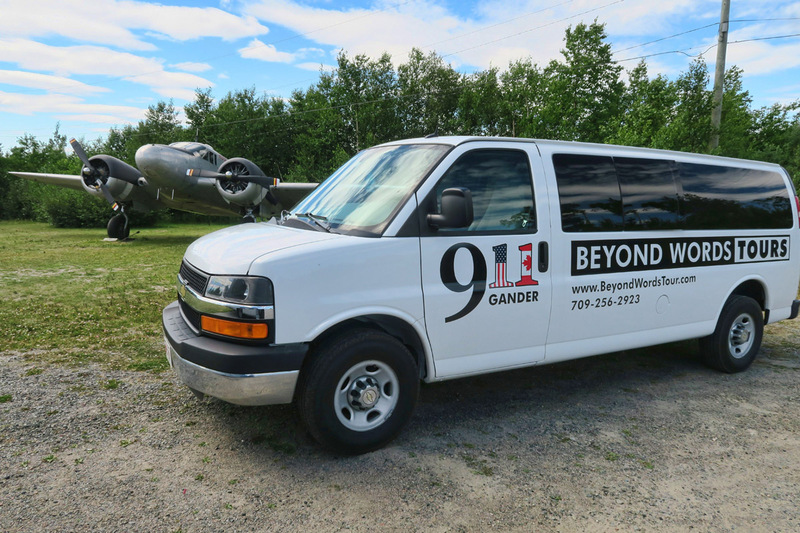 Should any type of aircraft emergency occur once pilots are past the point of no return from Europe, the pilot makes an emergency landing in Gander. For those who might not recall, on that fateful Tuesday morning in September, 2001 when all US airspace was shut down, then Transportation Secretary Norman Mineta spoke that famous line, “Get those goddam planes down!” Gander, along with the capital city of St. John’s, was the first airport in the North Atlantic flight path that could accommodate the jumbo jets in route to US airports. As many know, I was working in lower Manhattan on 9/11. I stood on the banks of the Hudson River and watched the buildings collapse. It would be two months before I would return to work again, instead making my daily pilgrimage to the edge of the river to stare in disbelief at the smoke billowing from what was once my daily commute. It was a dismal, depressing time of uncertainty, waiting out news as rescue attempts quickly turned to recovery efforts. My attitude needed constant adjustment as a reminder that I needn’t feel sorry for myself because I just lost my community and likely my job…I still had my life. Following these dark days, the story coming from Gander, Newfoundland was the one bright bit of news, a reminder that there was still good in the world. When the airspace was closed and the planes forced down, the people of Gander mobilized to take care of 42 flights (38 commercial and 4 military) carrying just under 6,700 passengers, nine dogs, ten cats, and two rare Bonobo monkeys. For four days, they put their lives on hold to take care of the “plane people” by clearing out all the surrounding High Schools, meeting halls, and churches, and filling them with beds, cots, and palates to accommodate their unexpected guests. Once the order was given that passengers could disembark, they needed a way to move them to shelters. School bus drivers were in the midst of a strike, but drivers laid down their picket signs and volunteered to drive passengers wherever they needed to go. They brought blankets, pillows, and clothing from home, and began cooking round the clock to feed their now doubled population. They organized a massive food drive, storing the food on the local ice rink at the Community Centre as refrigeration. They opened up their homes for people to take showers, and took them on tours and errands in their boats and cars. Free nicorette gum and nicotine patches were passed out to smokers stuck on the airplanes. Pharmacists contacted passenger’s physicians so over 1,000 prescriptions could be filled at no cost to the passengers. Phone calls home were free. Canadian Tire authorized the local store to give the “plane people” whatever they needed. For all these reasons, when planning out my Newfoundland itinerary, I knew I needed to go to Gander. I didn’t know where, but I just needed to go there…maybe the airport, maybe a stop at the local Lion’s Club, or even a visit to the Canadian Tire store. Some way to add something tangible to the memories. I learned there is a small exhibit in the corner of the North Atlantic Aviation Museum, a memorial to the people who gave so much over those four days. They also have “BeyondWords” tours for $99, where you are driven around, can visit the airport, and “talk to a bona fied city official.” But that feels a bit too exploitative to me. They are capitalizing on the popularity of the Tony-winning Broadway play, “Come From Away.” And after the collapse of their only livelihood, the fishing industry, who could blame them? But I’ll settle instead for the small exhibit at the air museum. This van is for the deluxe tour for $99. I’ll settle for the $7 version. 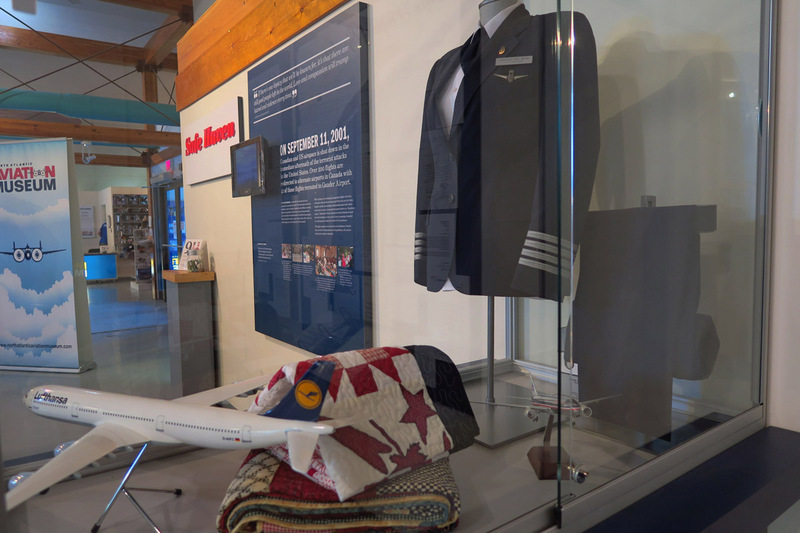 On display are several gifts sent from those stranded, including the uniform of the Captain of an AA flight. 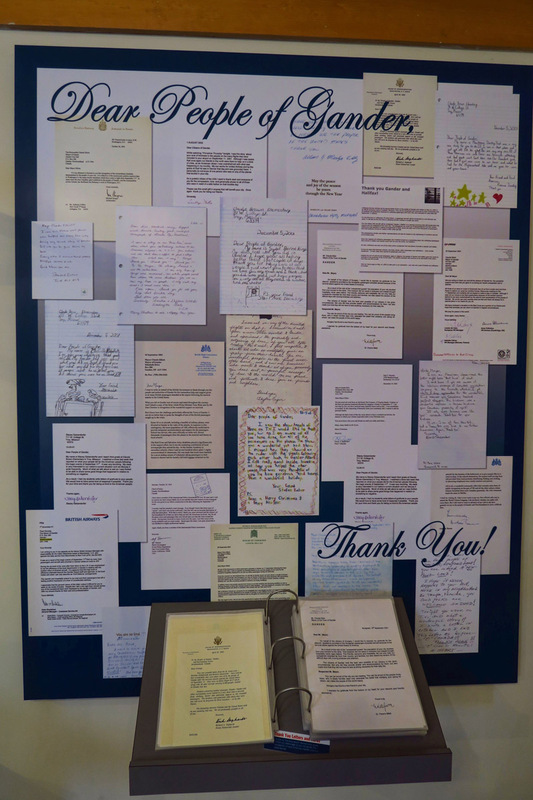 On the wall are just a few of the Thank You notes sent to the town of Gander. 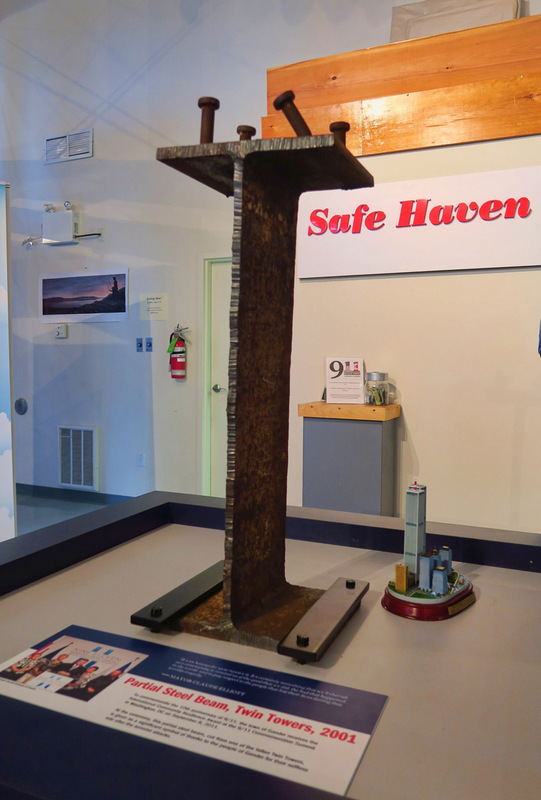 This is a cross-section of one of the steel I-beams from the World Trade Center. Out in the open and okay to touch. Or caress. 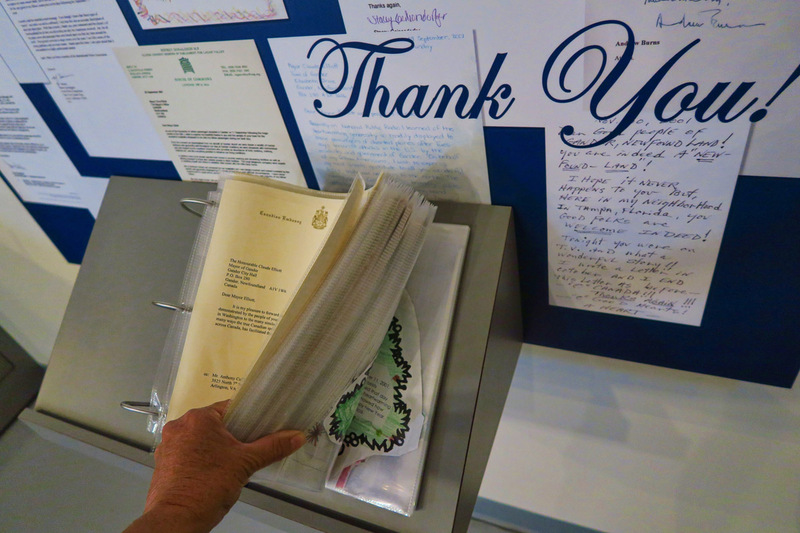 This entry was posted in Canada, Newfoundland and tagged Gander, North Atlantic Aviation Museum, September 11th by Suzanne. Bookmark the permalink. I didn’t get through this without choking up either. Thank you. Wow, Jim. I had no idea that you were stranded in Halifax. Interesting account of that day that left so many impressions on all of us. I think the reason Gander got so much “press” was because being so small (pop. less than 10.000) they didn’t have many hotel rooms. What they did have had to go for airline crew so they would be “legal to fly” when the airspace reopened. As I understood it, no one but crew was allowed in the hotels, so the residents had to take them in. Still, the whole “Operation Yellow Ribbon” all throughout Canada was very heartwarming. Thanks for this one. I worked near Boston and the silence of the skies was thunderous in its silence in the days that followed. Two days later as I was waiting for the light to change in my convertible on my way to work I heard the sound of two fighter Jets as they passed slowly overhead, the only planes in the sky. Wonderful people in this world, glad some of them were in Gander. This is so beautiful, and brings back so many memories, one of which was trying to reach you for two days after 9/11, and how horrible that time was for all of us. I want to see the play just to remind myself of the beauty in this world. Thank you for sharing!!! A heartfelt commentary on the good and graciousness of the best of mankind. Thank you. I was working in midtown Manhattan on the day that forever changed the world. I had no idea about Gander and their massive efforts and generosity. Beautifully written. I had no idea there were that many planes landing in Gander. What nice people they are. 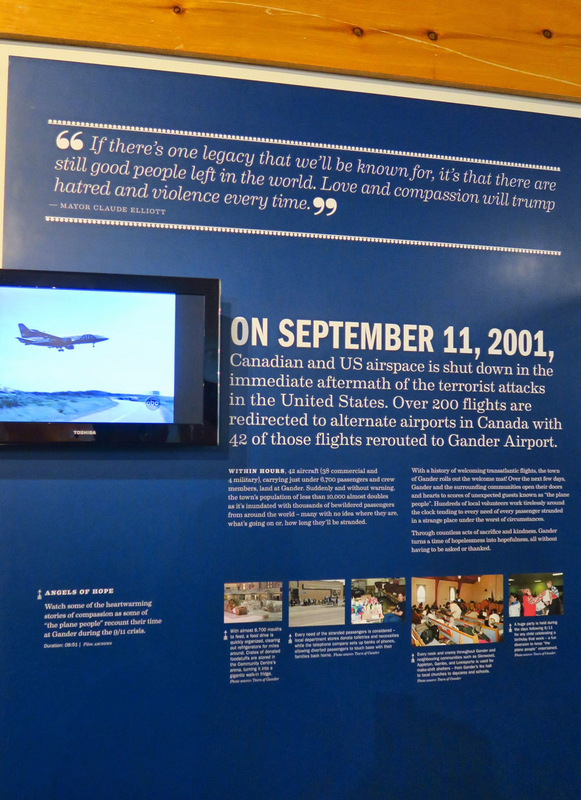 I also do not recall hearing about all the planes landing in Gander and the kindness they bestowed upon the passengers. So glad you got to visit and see the exhibit. It must have been a very emotional experience. Wonderfully written. Having spent nearly 7 weeks on Newfoundland & Labrador we are finally going to make it to Gander tomorrow to see the museum. I have nothing but the utmost respect and gratitude for the people of Gander (and now I learn, Halifax) but from our experience here these past weeks I think just about any community would have and in fact has done the same. It’s the Newfie way! Remembering the HMS Raleigh at Point Amours as well as so many other shipwrecks on the points of this wonderful land. Great post Suzanne and I did use ip a tissue or two as well.